Even the most well-known people have struggled to succeed! Find out what they learned and how they turned their failures into triumphs with this engaging and youthful guide on how to succeed long term.There is a lot of pressure in today’s society to succeed, but failing is a part of learning how to be a successful person. In his teaching career, Luke Reynolds saw the stress and anxiety his students suffered over grades, fitting in, and getting things right the first time. 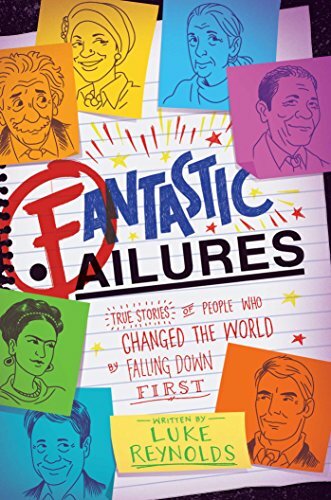 Fantastic Failures helps students learn that their mistakes and failures do not define their whole lives, but help them grow into their potential. Kids will love learning about some of the well-known people who failed before succeeding and will come to understand that failure is a large component of success. With stories from people like J. K. Rowling, Albert Einstein, Rosa Parks, Sonia Sotomayor, Vincent Van Gogh, Julia Child, Steven Spielberg, and Betsy Johnson, each profile proves that the greatest mistakes and flops can turn into something amazing. Intermixed throughout the fun profiles, Reynolds spotlights great inventors and scientists who discovered and created some of the most important medicines, devices, and concepts of all time, including lifesaving vaccines and medicines that were stumbled upon by mistake.